You’re invited to the Opening Reception of the Gold Key Art Exhibition at The Met on Friday March 24, 6:00-8:00 pm. The exhibition features Gold Key artwork and writing created by NYC’s most talented teens. All are invited and no RSVP required. Come celebrate the 2017 NYC award recipients and design your own tote bag too! Was your 2017 Art submission awarded recognition at the Honorable Mention or Silver Key level? If so, your work will be displayed digitally at the Opening Reception! Was your 2017 Writing submission awarded recognition at the Honorable Mention, Silver Key, or Gold Key level? If so, you’re encouraged to enter a lottery to read an excerpt of your work at the Opening Reception. Student readings will be limited to three (3) minutes and the countdown begins after you’re handed the microphone. Interested? Enter the lottery at the opening reception from 6:00-6:25 pm. The Honorable Mention/Silver Key and Gold Key lineups will be announced at 6:45 pm after the Welcome Remarks are concluded. Refer to the program schedule for more details. Design Your Own Tote Bag! A free workshop will be offered to all guests. Free Admission Ticket! All guests will receive a free ticket to view the rest of the museum’s collections. We hope you check out the galleries after enjoying yourself at the Opening Reception. Scroll down for more information about the Opening Reception. Honorable Mention and Silver Key recipients read short excerpts from their works (up to 3 minutes) in the Carroll Classroom. Readers selected by lottery. Eligible readers may sign-up for the lottery in the Carroll Classroom, 6:00-6:25 pm. Gold Key recipients read short excerpts (up to 3 minutes) from their works in the Carson Family Hall. Readers will be selected by lottery. Eligible readers may sign-up for the lottery in the Nolen Library, 6:00-6:25 pm. Facilitated by The Met. Get creative by designing your very own tote bag in the Studio. Explore how words can become art by engaging with images of primary works of art from the Museum’s collection to spark tote bag design inspiration! The Museum is open until 9:00 pm. We hope you will explore and enjoy the galleries! There are only TWO days remaining to submit! Work(s) must be uploaded by 11:59 pm on December 15th. Submission forms must be postmarked by December 15th as well. The James A Farley Post Office in Manhattan (421 8TH Avenue) stays open until 10 pm to accommodate last minute rushes. Submission forms must be signed by the student, an educator and the student’s parent/guardian. You may pay the submission fee online via PayPal or include payment with your submission form. We accept checks, money orders and cash too but please note that we DO NOT recommend sending cash in the mail. Take the time to review your work before submitting it to ensure that you are sending the absolute best representation of your talent. 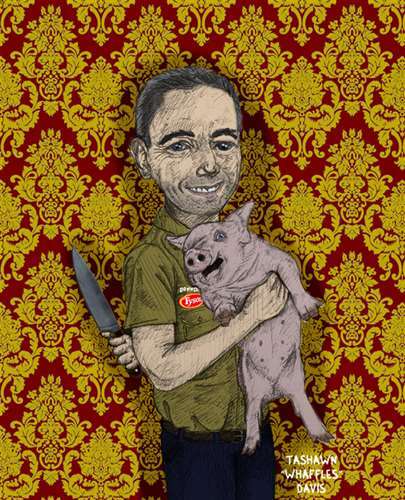 Images of uploaded art submissions should have a high resolution and be properly cropped. Writing submissions should be proofed for grammar, spelling, style and content. Personal statements are an additional opportunity to shine. Make sure that yours captures your creative insights. 1. Can I or my parent drop off my submission form at your office? Yes! There is a drop box in the lobby at 557 Broadway where you may leave your submission. Submissions will be collected from the drop box daily. Please note however that staff is extremely busy preparing for the judging of the hundreds of thousands of submissions we receive and therefore will NOT be able to come downstairs to personally receive each submission. 2. My teacher is absent. Can I submit the form without his/her signature? No! However please note that any educator at your school, after school program, local library etc. can sign your form. 3. Can I include my name in the title of my portfolio or individual submission? No! Your work is judged blindly on its merit and therefore no identifying information should be included in the title of your portfolio or individual submissions. 4. Can I apply for an extension? No! However, we invite you to submit your work(s) next year and recommend that you begin thinking about and preparing your submission soon after the submissions period opens in mid-September. Questions? If you have questions about submitting your work, first carefully review the Do’s and Dont’s for each category here and thoroughly review our FAQ page. If your inquiry is unanswered by the information on our site, send a detailed email to info@artandwriting.org with your specific issue/concern. Results for the 2016 NYC Scholastic Awards are here! 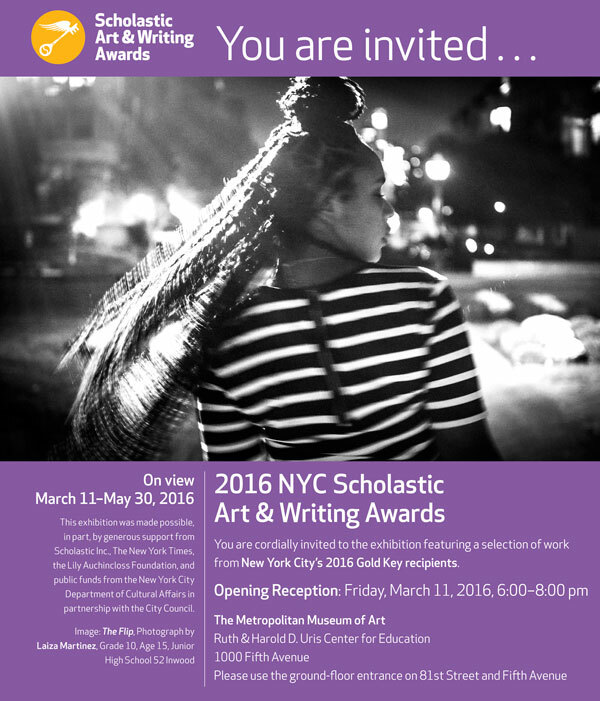 Congratulations to everyone who submitted to the 2016 Scholastic Art & Writing Awards! We had over 11,000 submissions this year!! That’s a lot of fabulous creativity…Way to go New York City! Without further ado, here are the NYC Regional Recipients for 2016. All Awards recipients will receive an email detailing certificate, ceremony, and exhibition details. If you have any questions please email tendo@artandwriting.org. All Gold Key and Silver Key recipients in grades 7-12 will be invited to be honored at the Regional Ceremony, which will take place at the Tishman Auditorium at The New School on Sunday, March 13st. 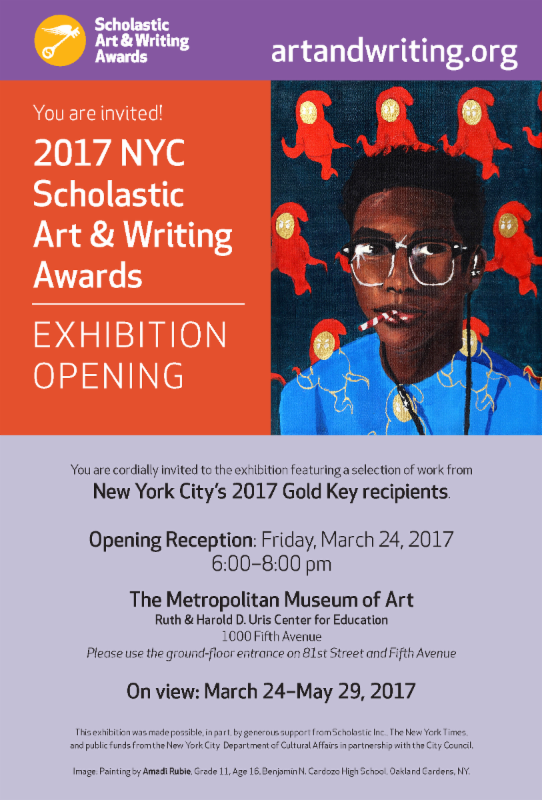 All Gold Key recipients from grades 9-12 will be invited to choose one Gold Key-awarded work for The 2016 NYC Scholastic Art Awards Exhibition, which will take place…at the Metropolitan Museum of Art!! You may drop off your artwork on Thursday, February 4th, 10:00 am-7:00 pm, Friday, February 5th, 10:00 am-7:00 pm, or Saturday, February 6th, 10:00 am-4:00 pm. Due to space limitations, Gold Key artwork from students in grades 7-8 will be displayed digitally. Regional Gold Key works will automatically be considered for national recognition. National Medalists will be announced on Monday, March 14, 2016. Students and educators can log into their accounts at www.artandwriting.org to find if they’ve received a National Medal. Stay tuned for your notification email for more details. Tomorrow December 16th is the deadline for submissions. Student work must be uploaded by 11:59 pm. SUBMISSION FORMS MUST BE POSTMARKED BY DECEMBER 16th. The best way to ensure that a submission form is postmarked is to personally visit a post office and hand deliver your envelope to a window agent and request that your properly stamped envelope be postmarked to demonstrate compliance with a deadline. LAST MINUTE RESOURCE: Do not despair if you’re scrambling at the last minute. The James Farley Main Post Office at 421 8th Ave in Manhattan is open until 10 pm. Does the submission form have to be received by December 16th or postmarked by December 16th? It must be postmarked by December 16th. Can I hand deliver my submission form(s) to the Scholastic office? Delivery via snail mail is recommended, however, you may drop off your submission at the reception desk on the 1st floor of the Scholastic Inc. headquarter building at 557 Broadway. It will be staffed until 7 pm. Does an educator need to sign the submission form? Yes an educator needs to sign the form irrespective of how and when the work being submitted was prepared. Any educator at a student’s school may sign the form. I have an exigent circumstance. Can the deadline be extended? No. The deadline of 12/16, 11:59 pm is absolute for all NYC students. Where can I find the submission form? After logging onto artandwriting.org, you’ll see “Welcome to your dashboard”. Below, you’ll see 1. My Profile, 2. My Uploads and 3. Print, Sign & Mail Your Forms, and Pay For Your Submission. To the right there is a button labeled See My Submission Form And Payment Options. Click on that button to generate your submission form. This is a reminder that the deadline for submissions is Wednesday, December 16th, only two weeks away! Don’t forget about our newest award category, Editorial Cartoons. The category, Editorial Cartoons, sponsored by The Herb Block Foundation, is designated for artwork that conveys a political theme or message. Up to three Medal recipients in this category will each be awarded a scholarship of $1,000. This is an incredible opportunity for teens to be recognized and celebrated for their talent and ideas. A fee waiver is available to any student with a financial need. Editorial cartoons may be in the form of, but are not limited to single panel drawings with captions, sequential comic art, illustrations, digitally created drawings, or animated films with a political theme or message. I sincerely hope that all NYC teens share their unique perspectives about current local and world issues by participating!